Substitute 1/4 cup of spinach puree for the green pasta instead of beets. Follow the recipe the same. - TO MAKE THE BEET AND SPINACH PUREE, COOK FULLY BY ROASTING OR STEAMING AND THEN PUREE IN A FOOD PROCESSOR WITH SOME WATER (1/8 TO 1/4 OF A CUP OF WATER). Start off by placing your flour into a food processor. Next, place the lid on top of the food processor and remove the top attachment. Now, place your eggs, olive oil and beet puree into a measuring cup and whisk to blend. Once the wet mixture is ready you can incorporate it slowly into the dry mix by pouring it through the top opening of the food processor, while pulsing the flour. You will know when the dough is ready when you can pinch the mix and it holds together. (If the dough feels too wet add in more flour, if too dry add in some more beet puree. Now, pour out the pasta dough onto a well floured surface and kneed the dough for 2-3 minutes. You will know you are done kneading when you can't fold the dough into itself anymore. Wrap the dough with plastic wrap and let it sit at room temperature for 30 minutes. When the dough is done resting, cut into quarters and roll each piece out into 1/4 inch thick rectangles, then pass each through the lasagna pasta Kitchen-AID attachment. Start by passing each rolled out rectangular piece of dough through level 1 on the attachment twice. Next, pass each piece of dough through level 2, and 3 once. When you have all the dough prepped switch the Kitchen AID attachment to the Fettuccini cutter and pass each prepared sheet of pasta through one time making the fettuccini strands. 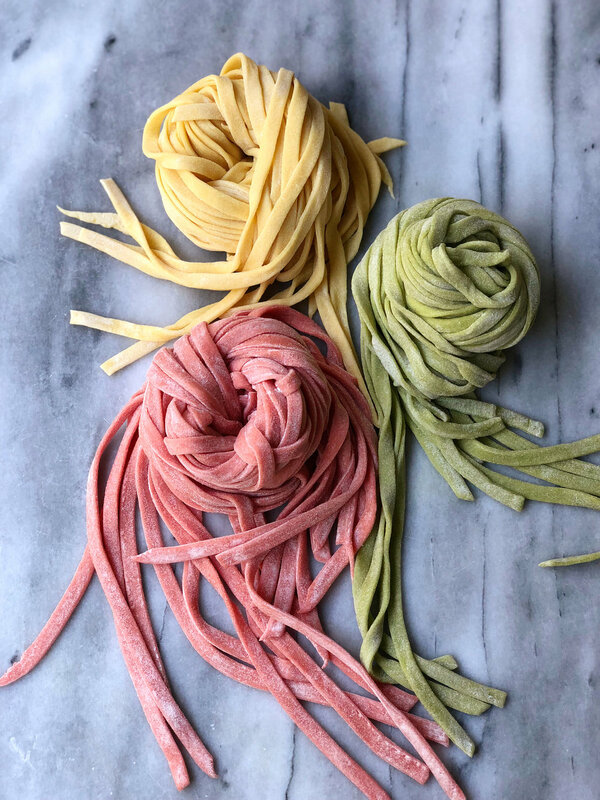 Before cooking or storing you will need to toss the pasta in some APF to make sure the strands of pasta don't stick to each other. Now that you have made your fettuccini pasta you can go ahead and cook the pasta in a pot of boiling, salted, and oiled water. The other option is to store the pasta in the fridge for a couple days. If you want to store the pasta for longer, dry out the pasta completely and store in an airtight container. Enjoy with your favorite sauce or just some olive oil and a shaving of parmesan cheese!